Easy Photo Uploader for Facebook is a fantastic tool that help your way of uploading your photos to your favorite social networking site, Facebook. With this outstanding software, you don't need to log in with your Facebook account from browser. Just go to the folder of photos you want to upload, right click, and then choose the option to send it to your account. 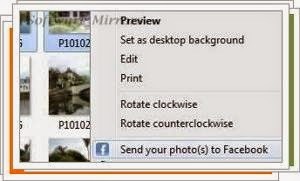 Easy Photo Uploader for Facebook can even upload your photos to a specified album. Easy Photo Uploader for Facebook is so efficient that when you upload them, your photos will be adjusted to the size limit allowed by Facebook automatically. Moreover, this handy program can even transfer photos with different formats. It will automatically convert them to JPG format. Easy Photo Uploader for Facebook is a great application, especially for Facebook fanatics who want to upload a lot photos on their account pictures. With this software you can easily manage your old and new pictures.